Youre currently reading The Authors Guild Protest: Thoughts 24 Hours Later. Abe: Thanks for the newest post! Really on target! The signature count is currently at 4,608! We are gaining ground, not enough however to have the Authors Guild return a phone call or establish a time for discussion. Perhaps they really believe the issue, like the protest, is "unfortunate and unnecessary." Frankly, that is unfortunate! 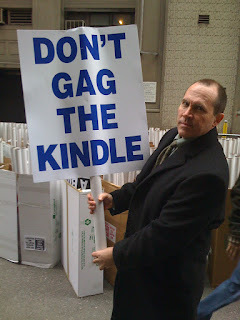 Thousands of people agree that it is unfortunate and presently we are receiving e-mails and posts to the petition site stating authors will begin boycotting even print materials from publishers who conspire with the Authors Guild! The petition is going mainstream! For those who want to sign visit http://www.thepetitionsite.com/1/We-Want-To-Read and then forward to your networks with your personal request to sign. You're very welcome. I was reading recently that Kindle-2 sales are through the roof; they're actually exceeding the device sales pace set by the 1st generation iPhone. Since February, over 300,000 units have been sold. I'm working on a new blog post on this. I'll let you know when it's up. Thank you again for your comments and support.